God Rah rah ah-ah-ah! Lady Gaga attends mass and responds to haters. As well as her more “normal” headline-grabbing antics, which in recent weeks have included high profile appearances at various public events, the pop superstar Lady Gaga has also been finding time to nurture her spiritual side. Thank you Father Duffell for a beautiful homily as always and lunch at my pop's restaurant. I was so moved today when you said.. "The Eucharist is not a prize for the perfect but the food that God gives us." – Father Duffell, Blessed Sacrament Church Nourishment. . 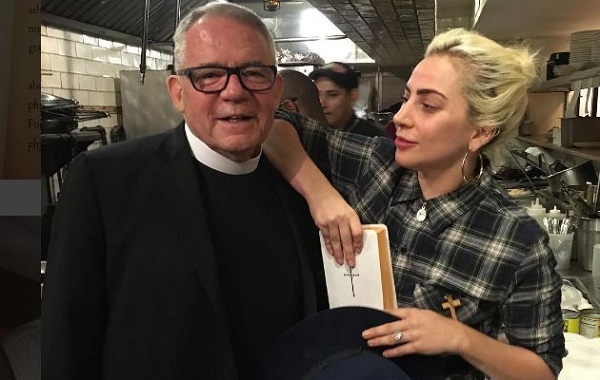 The second post came last Sunday, when the Bad Romance singer shared a photo of herself standing with Father John P. Duffel, after a service at New York’s Blessed Sacrament Church. She thanked him for his sermon, saying that she was “so moved” by what he had to say. Gaga’s Catholic roots go back to her childhood, when she attended New York’s Convent of the Sacred Heart School, and her faith has remained an important part of her life ever since- even as her pro-LGBT beliefs put her at odds with many conservative Catholics.